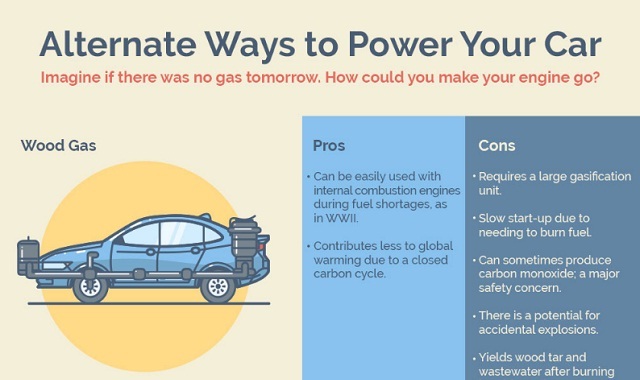 Alternative Ways to Power Your Car #infogarphic ~ Visualistan '+g+"
Because we’ve spent so much time using one method to power our vehicles, we have a different label for all energy sources other than gasoline: alternative fuels. List out the facts, and you’ll see that wood gas, gas bags, and steam have been used to power cars, and many more alternatives to fossil fuels have been worked on over the past several decades. As we try to move away from foreign oil and reduce carbon emissions, clean-energy cars have gotten more press, but researchers and enthusiasts have already been working on many different solutions to provide alternative fuels for cars. Pros and cons can be listed for each one: Electric cars, hybrids, hydrogen fuel cell cars, biofuel vehicles, solar-powered cars, and even nuclear cars each might have problems if put into use on a grand scale. But as we move toward a greener future, it’s important to see the realm of alternative-fuel cars as more than just a choice of renewable energy vs. fossil fuels. See some of the strange and amazing alternative-fuel options that have been worked on in our infographic list!